State Hymn "Utah We Love Thee"
State Song "Utah, This Is The Place"
Monument Valley: Red-sand desert region on the Utah-Arizona border. Zion National Park: National park in southwestern Utah. Arches National Park: National park in eastern Utah. Canyonlands National Park: National park in southeastern Utah. Hogle Zoo: Zoo in Salt Lake City, Utah. Park City Mountain Resort: Ski resort in Park City, Utah. Angels Landing: Rock formation in Zion National Park in Utah. Bryce Canyon National Park: National park in southern Utah. Great Salt Lake: Largest salt water lake in the Western Hemisphere, located in the northern part of Utah. Capitol Reef National Park: National park in south-central Utah. Thanksgiving Point: Museum in Lehi, Utah. Brighton Ski Resort: Ski resort in Brighton, Utah. Lagoon: Amusement park in Farmington, Utah. Temple Square: Religious complex in Salt Lake City, Utah. Snowbasin: Ski resort in Huntsville, Utah. Powder Mountain: Ski resort in Eden, Utah. Dinosaur National Monument: National monument on the Utah-Colorado border. Grand Staircase-Escalante National Monument: National monument in southern Utah. 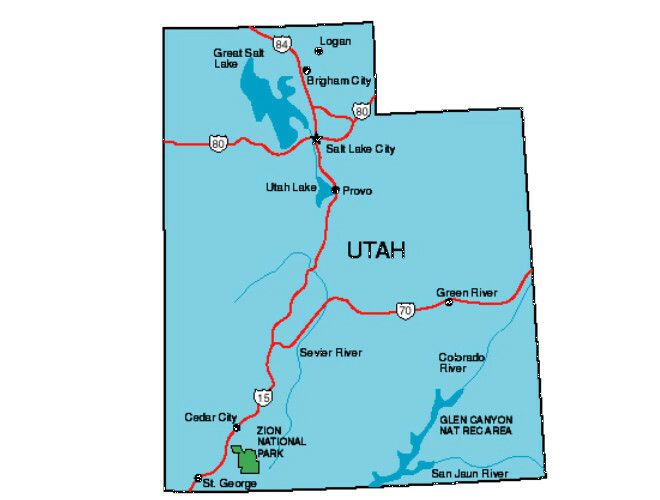 There are two theories on the origination of the word "Utah": The first is that it originates from the Native American "Ute" tribe which means "people of the mountains." The second is that it originates from the Native American word "yuttahih," meaning "higher up." In either case, the origin came from the Native Americans. 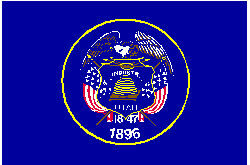 Utah is one of only two states in the United States to outlaw all forms of gambling. At Four Corners, in the southeast, Utah meets Colorado, New Mexico and Arizona at right angles, the only such meeting of states in the country. Approximately 62% of Utah residents are Mormons, or members of the Church of Jesus Christ of Latter-day Saints. Utah is the most homogeneous state in the nation in terms of religion. The Great Salt Lake is saltier than the ocean. Its salt content can be more than seven times that of the ocean. On May 10, 1869, the First Transcontinental Railroad was completed at Promontory Summit, Utah. The event was billed as the �Wedding of the Rails," as it represented the joining of railroads built by two companies, the Union Pacific Railroad and the Central Pacific Railroad. In 1912, policeman Lester Wire invented the first red-green electric traffic lights in Salt Lake City, Utah. In Utah, individuals may not supply beer to the public in containers larger than two liters unless they are licensed to do so. 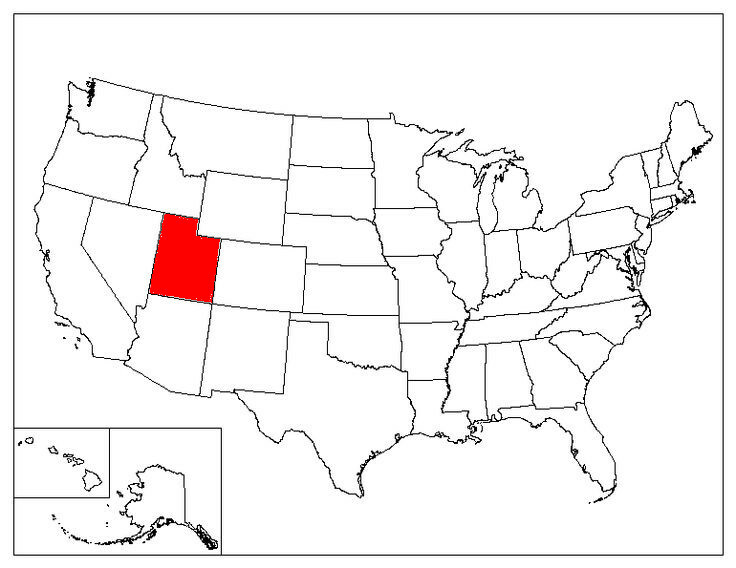 Utah is the only state with an official State Cooking Pot: Dutch oven.